It's very easy to use but if you need help please check the tutorials below. Here are some of the errors that you might see and what you can do about them. On both Mac and Windows, you may be asked to enter your session password to allow the ZXP Installer to perform changes to your system. If you correctly entered your password but still see this error, please open a support ticket. The ZXP file might be corrupted and you should download it again before attempting to install it. If this error persists, please open a support ticket. The extensions purchased from this website are signed and timestamped, however our installer may fail to verify the signature if it cannot properly access the Internet. Verify first that this error is not caused by your firewall or an intermittent Internet connection failure. If Adobe's Extension Manager CC is installed on your system, this may interfere with our ZXP Installer. In Extension Manager CC go to the "Tools"->"Preferences" menu item, and in the settings page uncheck "Allow Extension Manager to access Internet". You should now be able to install the extension using the ZXP Installer. If you are sure that your CC applications are properly installed and licensed, you most likely still have the old Extension Manager CC installed. Extension Manager CC is discontinued by Adobe, is not compatible with CC2015 anymore and can prevent the ZXP Installer from doing its work. Hence, you need to uninstall it. 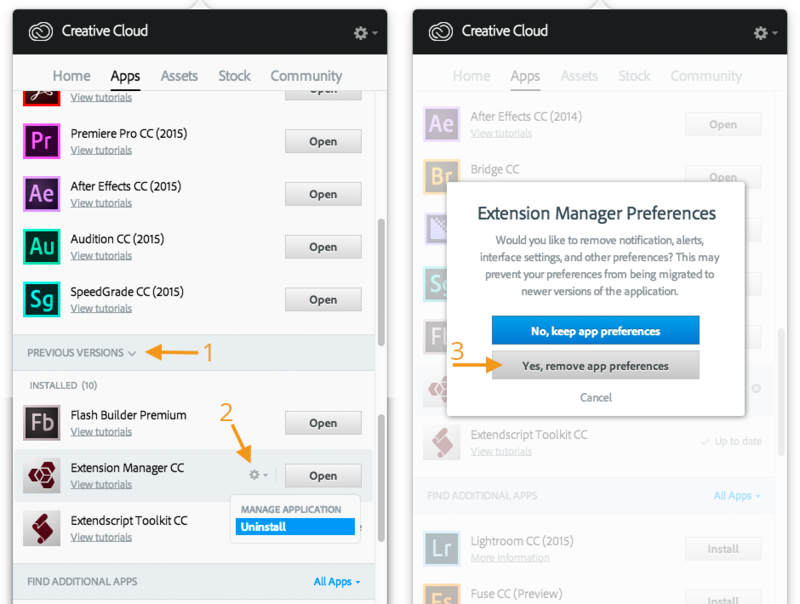 To uninstall it, navigate in the Creative Cloud desktop app to the "Previous Versions" section (1), choose "uninstall" for Extension Manager CC (2) and MAKE SURE TO ALSO REMOVE THE APP PREFERENCES (3). One customer also reported that he could solve the issue by logout and login again from the Creative Cloud desktop application. For more details see this support forum discussion. Some ZXPs are compatible with only certain versions of a CC applications. Make sure you are trying to install the ZXP file compatible with your installed version of the CC application. This way to install ZXP extensions should normally only be used by extension developers and is offered here as a last resort: should the ZXP Installer fail to install an extension, you should report this to help us enhance the installer.